Long Leaf (blue) will put his Golden Rose hopes to the test when he runs at Rosehill. Lindsay Park will push its claim for multiple Golden Rose berths when Long Leaf and Smart Elissim run at Rosehill. Saturday’s Run To The Rose (1200m) will give the stable an idea where the pair sits among the 20 three-year-olds they have entered for the Group One Golden Rose on September 22. Long Leaf, who performed well in Sydney during the autumn has had one run back from a spell. He finished second in the Vain Stakes behind stablemate Tony Nicconi, beating home last week’s impressive Caulfield winner Native Soldier. “He was terrific first-up,” co-trainer Tom Dabernig said. “The form has worked out although Tony Nicconi ran poorly last week, but the winner did come out of that race. After winning his first two starts, Smart Elissim finished third in the Up And Coming Stakes at Randwick on August 18, his first run in Sydney. Lindsay Park had Smart Elissim engaged for a race at Canterbury on Wednesday but elected to reserve him for his own age group on Saturday. “Taking on those hardened, older horses it’s never easy at this time of year, so we decided to keep him against his own age and see what he can do,” Dabernig said. The stable has scratched Muswellbrook from the Stan Fox Stakes but will be represented by Formality in the Sheraco Stakes. Formality had a good Sydney spring last year winning the Silver Shadow Stakes and Furious Stakes before running 11th in the Golden Rose. 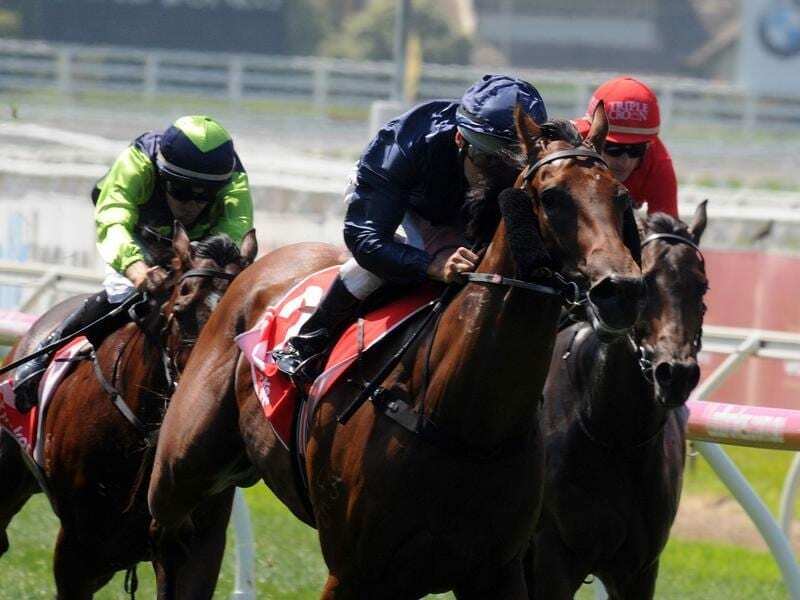 She returned to Melbourne to win the Blue Sapphire Stakes at Caulfield before running third in the Coolmore Stud Stakes at Flemington. She was diagnosed with heart fibrillation when last in the Lightning Stakes in the autumn before a disappointing run in the Sangster Stakes in Adelaide. “She’s trialled well but she’s still got a wintry coat and her hair’s falling out, so she won’t be the best looker in the yard on Saturday, but hopefully she’ll run well,” Dabernig said.